I have tomcat 5.5 installed, running and verifiable at http://localhost:8080/. The Tomcat menu option appears in the Eclipse menu bar and I can start and stop Tomcat from there. In Eclipse, it does not show as a Server Runtime Environment in Window - Preferences - Server - Runtime Environments, nor does it appear in the list of environments that can be added when I click the "Add" button. All I see is the J2EE Runtime Library. In my case I needed to install "JST Server Adapters". I am running Eclipse 3.6 Helios RCP Edition. Expand "Web, XML, and Java EE Development"
After that I could define new Server Runtime Environments. EDIT: With Eclipse 3.7 Indigo Classic, Eclipse Kepler and Luna, the steps are the same (with appropriate update site) but you need both JST Server Adapters and JST Server Adapters Extentions to get the Server Runtime Environment options. Select "Eclipse Web Tools Platform Repository (http://download.eclipse.org/webtools/updates)" from the "Work with" drop-down. Select "Web Tools Platform (WTP)" and "Project Provided Components". Complete all the installation steps and restart Eclipse. You'll see a bunch of servers when you try to add a server runtime environment. You need to go to Help>Eclipse Marketplace . 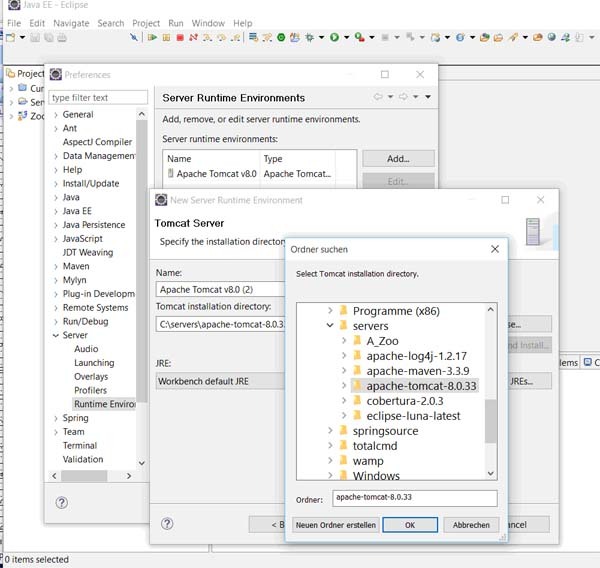 Then type server in the search box it will display Eclipse JST Server Adapters (Apache Tomcat,...) .Select that one and install it .Then go back to Window>Preferences>Server>Runtime Environnement, click add choose Apache tomcat version then add the installation directory . That has worked for the past 3 versions of Eclipse at least. If there is not such an option on your eclipse, get a fresh installation (for Java EE developers). nor does it appear in the list of environments that can be added when I click the "Add" button. All I see is the J2EE Runtime Library. Go get "Eclipse for Java EE developers". Note the extra "EE". This includes among others the Web Tools Platform with among others a lot of server plugins with among others the one for Apache Tomcat 5.x. It's also logically; JSP/Servlet is part of the Java EE API. You may get more success if you do a "search" for the runtime env from the preferences screen instead of hitting "add" - see this demo on youtube. http://www.youtube.com/watch?v=EOkN5IPoJVs&playnext_from=TL&videos=rVnITzSU2Z8 - When you hit search, you are prompted to point to the tomcat directory and then it SHOULD add it as a server runtime environment. Unfortunately for me, that is not the case (I get "no new server runtime environments were found") But you might have more success. Scenario 1: You had Eclipse showing server and now after removing the particular version you want to configure at Eclipse a new local server instance. But you can not move further. This happens due to reason Eclipse still looks for configured version of Tomcat directory, which directory is no longer there. There is no need till LUNA to make fresh installation! Not the answer you're looking for? Browse other questions tagged java eclipse tomcat or ask your own question. How to setup tomcat with Eclipse? Removing the Apache TomCat runtime from a project in Eclipse?